A Manuscript known as "the Trinity Tripos", dated 11th July 1688, was brought to light in a book published by Rev. John Barrett, (Vice-Provost, from 1806 to 1821, Trinity College, Dublin) in 1808. This MS. (Manuscript) clearly shows that Speculative Freemasonry was at labour in the 1680's some 37 years before the first recorded meeting of Grand lodge in 1725. The Trinity Tripos, Jonathan Swift and Speculative Freemasonry prior to 1725. The importance of the Trinity Tripos MS. (Manuscript) 1688 cannot be understated as this document, without doubt, establishes that Speculative Freemasonry was well known in Ireland in 1688 some thirty-seven years before the first recorded meeting of the M.W. the Grand Lodge of Ireland in 1725. The Tripos was a satirical oration delivered by the Terrae Filius(1), as he was called, and only two of these speeches have survived, both dating from the 1680’s with that of 1688 receiving special attention (2). The Tripos was discovered and attributed to Jonathan Swift solely as a result of the book by the Rev. John Barrett, Vice-Provost of Trinity College, Dublin (1806 - 1821) entitled “An Essay on the Earlier Part of the Life of Swift” published in 1808. As you will see below it is now accepted that the Trinity Tripos is not attributable to Jonathan Swift, but a fellow student of Trinity College. The Tripos was reproduced in its entirety by Rev. John Barrett in his book and through his analysis of the MS. he came to the conclusion that the Tripos of 1688 had been penned by Jonathan Swift. This conclusion was one of the goals of Rev Barrett’s book, not to establish that Freemasonry was a part of Irish society during the latter part of the seventeenth century. Accordingly the Tripos appeared in many publications of the works of Jonathan Swift, for example, by Sir Walter Scott in 1814 and 1824 amongst others. I have reproduced, for reference purposes, a .pdf copy of the complete The Trinity Tripos of 1688 from the 1824 edition of Sir Walter Scott’s “The Works of Jonathan Swift, D.D., Volume VI” and this can be accessed by the link at the bottom of this webpage. You will note that the majority of the footnotes are from Rev. Barrett’s book and their purpose is to identify the individuals referred to in the Tripos with a view to attributing the speech to Swift, the said individuals being his contemporaries. I have reproduced the Tripos in its entirety to show that the mention of freemasonry is almost incidental to a document that runs to some 35 pages. As stated the speech of the Terrae Filius occupies in the original MS., 35 closely written quarto pages, and is divided into three Acts or sections, of which the close of the second and the epilogue of the third act alone concern us (as Freemasons). I have reproduced below extracts of the sections of the speech relevant to Freemasonry. In Trinity College, Dublin the Tripos was delivered at the ceremony of graduation that was called the “Initia” or “Commencements”(3). The Terrae Filius who delivered the Trinity Tripos of 1688 on The 11th July of that year, was John Jones, a student of the senior year. The Terrae Filius, who from long custom was supposed to have the privilege, at public acts of the university, to throw forth his satire, with impunity, upon the Fellows and heads of the college, as well as among the community at large (4). 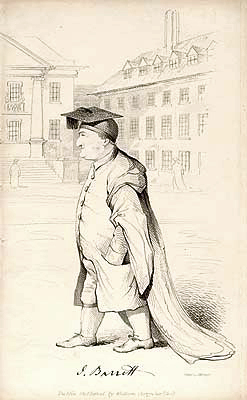 The Fellows of Trinity College, Dublin, who were present at the Commencements ceremony in 1688 were sufficiently shocked by the content and tone of the Tripos which was a mixture of ribald speech and bawdy dramatisations ridiculing staff and students to demand that the man largely responsible for it, the said Terrae Filius, John Jones, be expelled from the college (5). The sentence was afterwards mitigated into a temporary suspension of his degree and academical rights (6). “It is probable that…. the tripos may have been heightened by the satirical strokes of Swift…. I cannot think it likely that he was the principal author of the work for which Jones sustained the sentence of expulsion, since with all his grossness, it exhibits little of his humour (7)”. Accordingly it did not appear in later editions of the compilations of Swift’s works by Sir Walter Scott. Despite Sir Walter Scott’s opinion at that time that the authorship of the Tripos could not be attributed to Swift the question continues to be mentioned in academic papers regarding Swift. We find in a 2004 paper by Andrew Carpenter (UCD) concluding that Swift heard John Jones deliver the burlesque, parodic Tripos speech and that the 1688 text was clearly the work of a coterie and was written by various members of the Senior Class of which Swift was a member (8). The academic debate as to whether or not this 1688 MS. could be attributed to Jonathan Swift has resulted in evidence of Speculative Freemasonry being brought to the fore. This MS. has received the attention of academics as a result of they trying to establish Swift's authorship or involvement in same. Without this attention the MS. may have been largely ignored, being regarded as a curiosity, being no more than a recounting of a 17th century student “Footlights” performance. “Swifts initial access to Scottish style Freemasonry dates back to 1688, when he allegedly participated in a Lodge at Trinity College, Dublin (25). Working with a “club” of fellow students, Swift contributed to a satiric Tripos, which utilized inside knowledge to lampoon the Freemasons. In their high-spirited burlesque,Swift and his co-authors described the multi-class membership of Trinity Lodge, the links of certain rituals with chivalric military equipment, the Scottish associations of its numbers, and new methods of initiating gentleman (or Speculative) Masons. …(25) Philip Crossle “Freemasonry in Ireland circa 1725 – 31, The Lodge of research Transactions 1924 (1931) 169”(9). The relevant extracts of the Tripos also show, that in regard to Freemasonry, the Terrae Filius, could count on his audience understanding allusions to the prominent characteristics of the Craft and that he was addressing a mixed assemblage of University men and well-to-do citizens, who had come together to witness the chief University function of the year and his use of the [Masonic] theme proves that the freemasonry known to him and his audience was conspicuous for its secrecy and for its benevolence. We can fairly deduce, too, that membership of the Craft was not confined to Operatives, or to any class, otherwise the catalogue of incongruous callings would be without point (10). I would also suggest that the phrase “…freemasonized the new way” is the most telling remark in the speech and indicative of a change from Operative Freemasonry to Speculative Freemasonry during the latter part of the 17th century. In conclusion, the following remarkable extract set out in the Appendix from the Tripos demonstrates that the Fraternity of Freemasons was well known in Dublin in 1688 and the importance of such public notice of Freemasonry at that time could not be understated as the instances of any mention of our Fraternity in Ireland before 1700 is almost non-existent. (1) Lit. “Son of the Earth” ~ formerly, one appointed to write a satirical [latin] poem at the public acts in the University. (2) “Hermathena” (Trinity College publication) (1981). (3)“Masonic Reprints and Historical Revelations…”, Henry Sadler & W.J. Chetwode Crawley (1898). (4) “The Works of Jonathan Swift, D.D.,” Sir Walter Scott (1824). (5) “Verse in English from Tudor and Stuart Ireland”, Andrew Carpenter (2004). (6) “The Miscellaneous Prose Works, Volume I”, Sir Walter Scott (1861). (7) “The Miscellaneous Prose Works, Volume I”, Sir Walter Scott (1861). (8) “A Tale if a Tub as an Irish Text”, A Paper by Andrew Carpenter delivered at the Deanery of St. Patrick’s, Dublin (16 -17 October 2004). (9) “Esoterisme, gnoses & imaginaire symbolique: melanges offerts a Antoine Faivre”, Richard Caron etc. (2001). (10) “Masonic Reprints and Historical Revelations…”, Henry Sadler & W.J. Chetwode Crawley (1898). (11) Porfessor and eccentric, John Barrett was born at Ballyroan, County Laois, son of a cleryman. Educated at Trinity College, Dublin. Took Fellowship and became Professor of Oriental Languages. Vice-Provost in 1807. A noted eccentric, he scarcely ever left the college in the last fifty years of his life. Living in a garrett in the Library square, he allowed himself no fire, even in the coldest weather, and devoted himself to his two passions, reading and the hoarding of money. He was short, with a huge head and small feet, and so mean and ragged in his appearance that the college servants objected to his presence. He was a man of great acquirements and tenacious memory, yet extraordinarily ignorant of the things of common life. He spoke Latin and Greek fluently, but had great difficulty in expressing himself in English. He died in 1821, leaving £80,000. His will stated, 'I leave everything I am possessed of to feed the hungry and clothe the naked'. The relevant Pages of the Trinity Tripos, which refer to Freemasonry, have been reproduced below in the form of a "Slideshow", which can be paused by "clicking" on the document. the link below the "Tripos" slideshow. To access the relevant pages which refer to Freemasonry please click on the following link "Tripos"
If you wish to access the entire Trinity Tripos 1688 for reference purposes you may do so by the following link - The Trinity Tripos 1688.